See that pie? That is a prize-winning pie. It’s a Gizzi Erskine recipe, from her new Season’s Eatings book. My husband baked it on 30th October because Gizzi was running an Instagram competition. 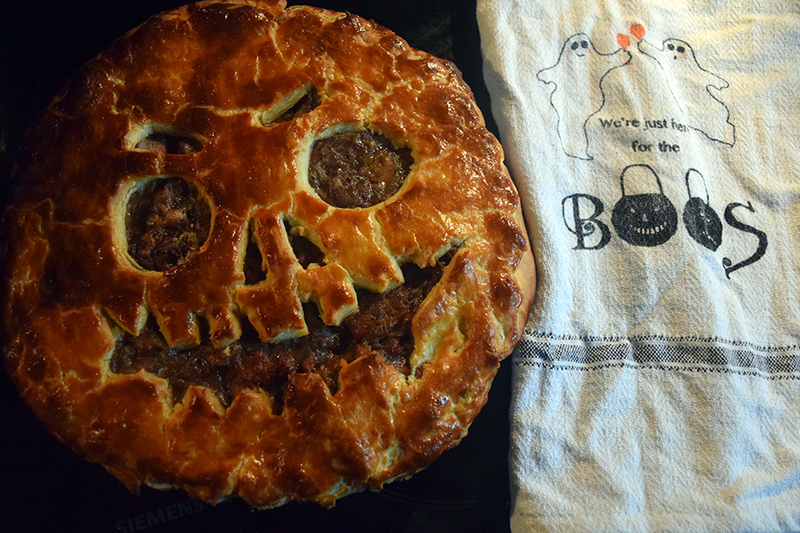 If you baked her spooky coq au vin pie over the Halloween weekend and posted a picture of it to Instagram, you could win two tickets to her Thanksgiving event at the Drapers Arms. As big Gizzi fans, we obviously had to enter, and, well, the first sentence of this post was a bit of a spoiler, really. My husband’s mad baking skills and my (clearly) brilliant food photography skills won us the tickets. So despite not being American in the slightest, yesterday we went to a Thanksgiving feast. It was a bit scary when we first arrived. The pub was set up with long dining tables, but most people had arrived in pairs. That meant there was a terribly awkward period where no-one was sure where to sit, and then people started to sit at each ends of the tables, until finally latecomers had to ask if they could sit in the middle. Argh. But then the mulled wine started to kick in, and someting strange started to happen. Everyone started talking to one another. First the people sitting immediately next to them, and then the rest of the table. When the food arrived, it arrived on huge sharing platters, and soon everyone was laughing and joking and passing plates around. I should say at this point that the food was incredible. Gizzi served up buffalo cauliflower with blue cheese and celery to start, then a spiced roast turkey with endless side dishes and incredible roast potatoes for the main course, followed by a brown butter maple pumpkin pie. There was a cheese plate at the end, but I don’t think many people had room. It all tasted incredible – but then I’d expected it to. I think I knew the food would be amazing, because Gizzi’s recipes seem to be reliably amazing. I think what I wasn’t expecting was for everything else to work so well. The atmosphere, the conversation – and yes, the wine – were all brilliant. I had an amazing night, and when Gizzi came out at the end to talk about her take on Thanksgiving, the applause was deafening. If you’d asked me a month ago whether I wanted to spend Thanksgiving with a bunch of strangers, I’d’ve said… well, I wouldn’t have waited for you to finish the question before running screaming in the opposite direction. But actually, I’m really thankful that I did. 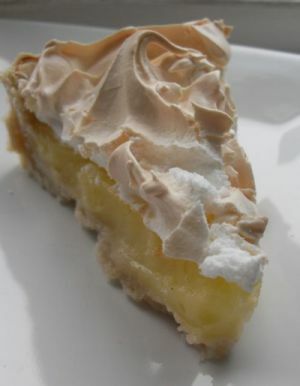 Somehow, meringue never seemed like a thing I could actually make. It’s just too … weird. Preheat the oven to 200 degrees. Rub the butter, salt and flour together in a bowl, then add in just enough of the cold water to bind it together and create a soft dough. Roll out the pastry and use it to line a greased pie dish, prick the base with a fork, and chill it for 10 minutes. Then blind bake the pastry shell – put some greaseproof paper on top of it, weigh it down with rice or similar, and bake for 15 minutes. Then remove the paper etc and bake for a further 5 minutes. Grate the zest from the lemons, then juice them. Mix the cornflour into the lemon juice in a pan, then add water, lemon zest and butter and heat until the mixture boils, stirring regularly. Keep stirring over a low heat until the mixture is thick and smooth (kind of like a lemon curd, only it takes nowhere near as long). Remove from the heat, and whisk in the sugar and egg yolks. At this point, it’s probably worth tasting the mixture – mine was very sharp, and I probably could have added a bit more sugar. Once you’re happy with it, pour the filling into the pastry base. Once it’s cooled, stick it in the fridge till the lemon filling has set. Preheat the oven to 170 degrees. Whisk the egg whites until they get thick enough to stand up in firm peaks, then gradually add in the sugar until the whole mixture is stiff and glossy. Spoon onto the top of your pie, then bake for 25-30 minutes.